The G-values declined rapidly after the 1988-1992 burst of high numbers. Mostly below 2 in 1995-96 (end of cycle) compared to mainly double figures from late 88 to early 92. What is the reason for the end in 1996, 20 years and almost 2 cycles ago? However, given the renewed interest for this series, we thought that it would be worth starting the routine production of group numbers extending this series, in order to provide a longer overlap with all other modern solar indices, which only appeared in recent decades. So, this is in preparation in our World Data Center and it will be implemented probably in (early?) 2018. Note however that this group number would be part of the production of the existing international sunspot number that our WDC-SILSO is routinely producing using the counts from our worldwide network of observers (85 stations). It is just a simpler “byproduct” quantity that only uses the group counts, while the sunspot number uses both the group and spot counts (the latter give a measure of the actual size of the groups). suspect and not reliable nor useful for studying the long-term variation of solar activity. The bottom line is that we have a perfectly good GN [also agreeing with the official SN], but that that there is a whole cottage industry dedicated to show that the old Hoyt & Schatten series is good [because it supports the idea of significant solar influence on climate]. Not even Ken Schatten believes that anymore. Thanks for your links Leif. I’ll let Ilya know you say he has it all wrong. 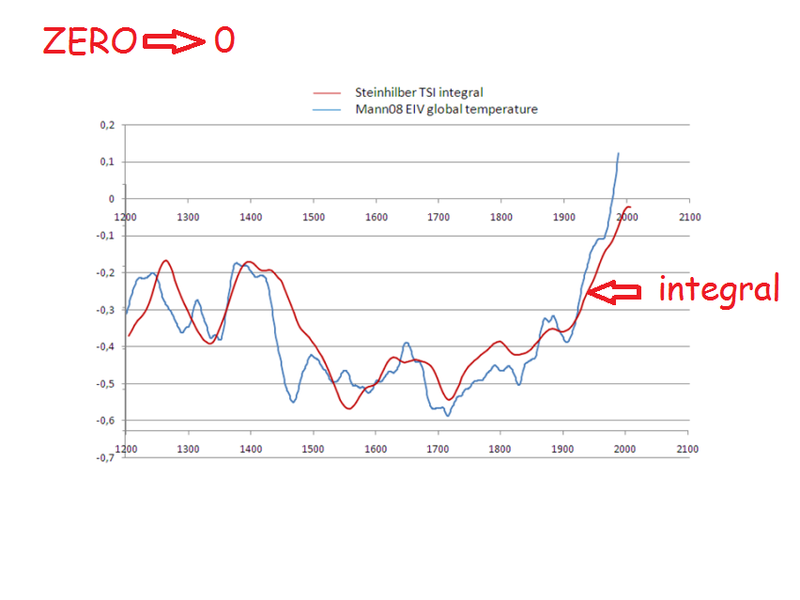 As for the solar influence on climate, I’d say that was pretty undeniable, simply looking at the 10Be record (in blue). Our simple orbital resonance model (in yellow) replicates it very well too. So as well as a solar influence on climate, we have the planetary influence on solar variation. I know you don’t like that either, but there it is. Science moves on, and the days of ironing the solar record flat are numbered. ” I’d say that was pretty undeniable”. At around half the timescale your plot refers to, here’s what you get by integrating the 10Be data in the same way vs Mann’s later effort on millennial temperature. The Sun controls the climate. You backed the wrong horse when you threw in your lot with Steven “Truth vs Effectiveness” Schneider and his carbonated climate cronies I’m afraid. Integrating the deviations from the long-term average always gives a zero result, so that is no good. The average, the window size, the end points, the AMO, etc are all free parameters and with enough of those you can fit anything. von Neuman: “with four parameters I can fit an elephant, with five I can make him wiggle his trunk”. As far as solar activity is concerned, the sunspot number [or the group number] reached the same heights in each of the three centuries 18, 19, and 20th within 15%, but the climate was vastly different. Etc, etc, etc. Solar activity now is as low as a century ago, yet it is much warmer now than then, etc, etc. All this are the same old points that everybody knows. Leif: Integrating the deviations from the long-term average always gives a zero result, so that is no good. Quite clearly it doesn’t zero out on the millennial timescale, as you can see from the 1200-2000 CE plot above. All the criticisms you offer regarding my simple SST model are well received, providing you admit they also apply to everyone else’s models and plots too. You will note the R^=0.93 applies to MONTHLY data, so not a very free parameter there anyway. 0.4C per doubling of CO2 is Lindzen’s estimate, and I’d go with his expertise in atmospheric science over yours any day of the week. The timing of the ~65 year cycle in the AMO isn’t a ‘free parameter’, and the amplitude is set by the estimate of the effect of the AMO on global temperature empirically derived from the thermometer record. Your comments about solar activity are quite funny coming from a solar expert who has an interest in climate. To assess the overall effect of solar variation looking solely at the maximum amplitudes of sunspot numbers in solar cycles is a piece of pure misdirection. The cycle lengths are at least as important when assessing the impact of solar variation on decadal or longer timescales. 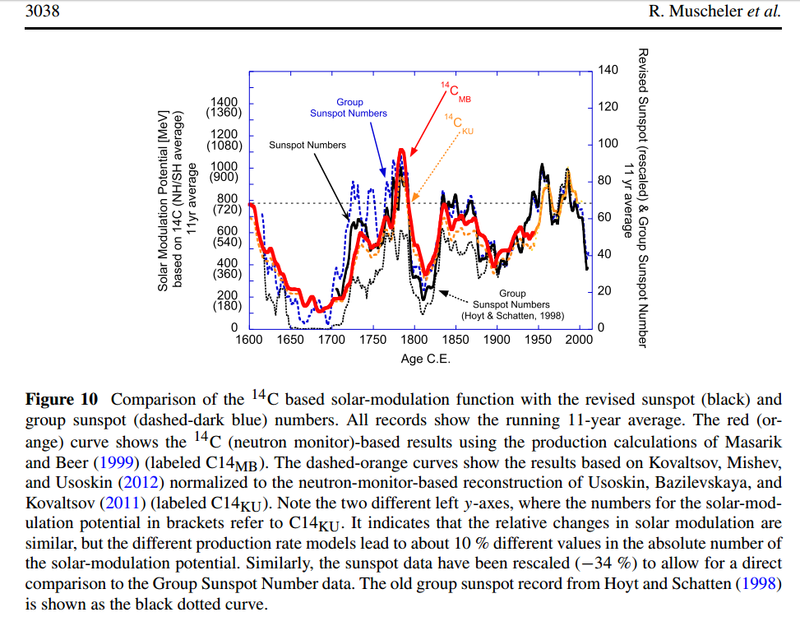 “Solar activity now is as low as a century ago, yet it is much warmer now than then”. After 70 years of higher than the longterm average of solar activity building up excess energy in the ocean heat content (OHC), you wouldn’t expect the temperature to suddenly fall back to 1910 levels after one low amplitude solar cycle, because the oceans have huge heat capacity, and that will take a long time to eke back out into the atmosphere during the coming period when solar activity is below the longterm average. Your thinking hasn’t progressed at all, I’m glad I don’t bother arguing with you at WUWT any more. If you subtract the mean value from a function over an interval, the result will be positive some of the time and negative some of the time. Adding up [integrating] those will get you a round zero, if you had calculated correctly. If you don’t divide by the number of records, then the result is the integral which is, of course, also zero. You’re confused. Allow me to help you. add up the differences and you get 0 as (-2) + (+2) = 0, (-1) + (+1) = 0. Leif, for your information, the long term average of the sunspot number over the period of record is also the sunspot number you get empirically from a comparison of SST and SSN as the value at which the ocean neither gains nor loses heat. That’s why it’s the right value to use for the integration of the solar data. It’s also why it’s a reasonable assumption that an integration of the solar data will give a fairly good representation of ocean heat content. 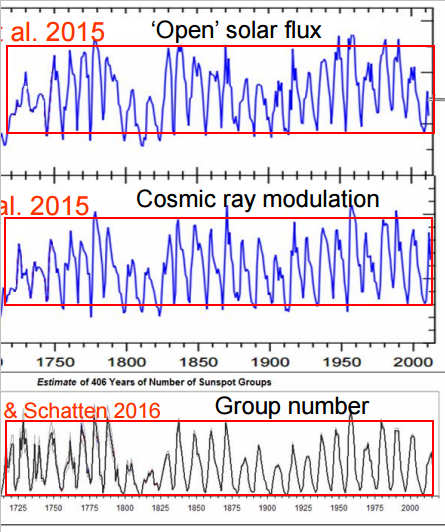 There has been no long-term trend in solar activity since AD 1700. As for the integral: you still don’t get it. But I think that no amount of education will get you there. Ah, the retreat to condescension without addressing the substantive argument. A classic Svalgaard distraction tactic. The 10Be data says there has been a trend in solar activity since 1700. As does everybody else’s sunspot series except the one you ironed flat. You are the outlier, soon to be left out in the cold when deliberations by the international team led by Matt Owens has completed its work. [Reply] Where are these published Leif? I can’t see the author’s names. As you can see: no long-term trend since 1700. End point effect Leif. And those plots run from 1750, not 1700. 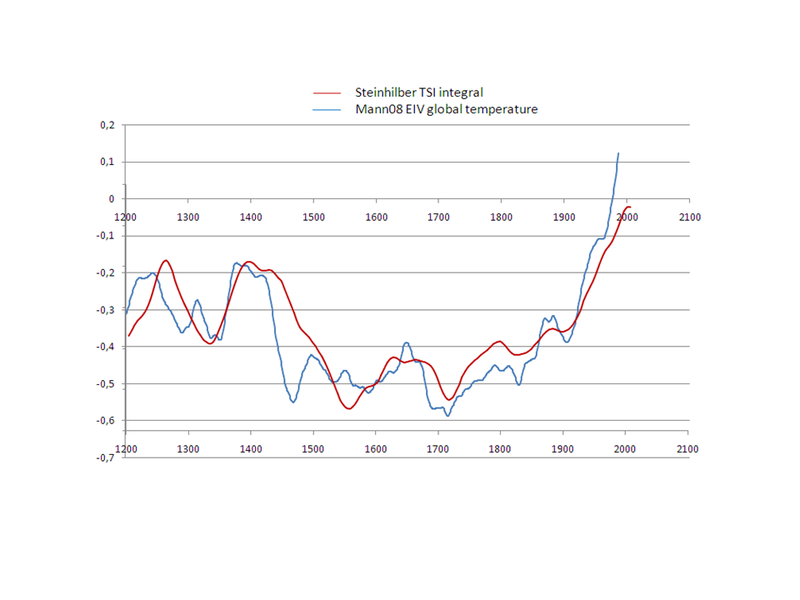 1700 to when the modern warming ameliorated in 1998 would show a trend. And unlike you, Matt Owens is willing to work with other solar experts, which we’ll see the results of in due course. [Reply] Yes I did. Which is why I asked for the citations you’ve clipped. The requested item does not exist. Lockwood, M., Mursula, K., O’Reilly, J., Owens, M. J., Scott, C. J., Sokoloff, D. D., Solanki, S.
[Reply] Ah, ok, so these are papers which have included your assessments among others? [Reply] This is not “the last word” on GSN because other experts disagree, and your reconstruction is the outlier of a number of other reconstructions. Peddle your propaganda at WUWT, you don’t get to do that here. No, those papers are by other people (Usoskin, Owens, et al.) and don’t use my stuff. [Reply] OK, I’ll go through them as I find time. The Muscheler paper not found is WordPress not cooperating. your reaction is a typical example of confirmation bias. You accept what matches your bias. [Reply] I’m happy to await the reviewed and published results of the international co-operation effort underway. Your dismissal of Usoskin’s GSN for a tiny error in counting spotless days over a two year period by one observer is typical of your deceptive bullying. Go back to WUWT, you won’t get away with it here. Cherry picking. You should have picked Figure 11. Do me a favor and show it here. [reply] Sure. Do you have a hi res version of fig 11 and fig 10 as well? Springer won’t let me enlarge the open access versions. [Reply] Yes, the revised sunspot data (Clette et al), not the revised group sunspot record (svalgaard & Schatten). Decades of discrepancy by several observers. [Reply] Usoskin is preparing an addendum to their paper. Feel free to comment on it in the literature. You’re not getting a platform to snipe at them here. can be enlarged as you wish. 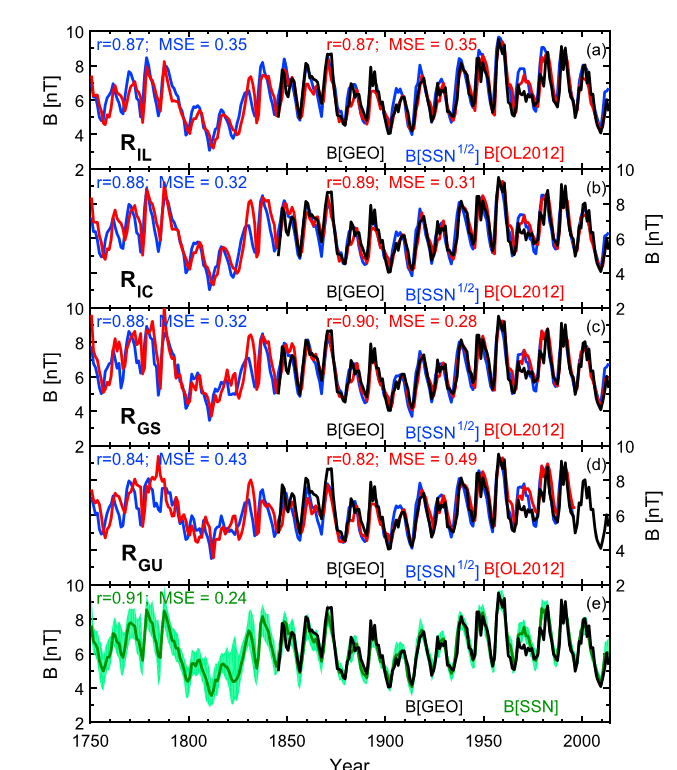 Here are figs 10 and 11 from the Muscheler paper, showing the radio-isotope series and the revised sunspot (Black: Clette et al 2014) and group sunspot (Blue: Svalgaard & Schatten) series. Clette appears to be a more ‘middle of the road’ reconstruction compared to the Svalgaard outlier. 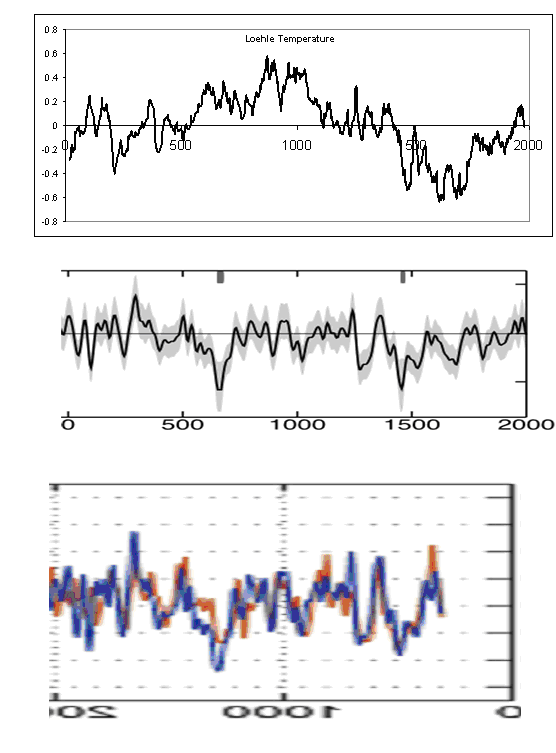 The 14C and both 10Be curves show a definite uptrend from 1700, as does the (Clette et al) revised SSN series. Finally, a comparison of Svalgaard/Schatten and Usoskin’s new reconstruction of GSN, showing quite strong divergence in late 18th and mid 19th century peak amplitudes. As usual, Svalgaard’s reconstruction is tending towards a flattening of the solar record, and disagrees with the empirical evidence from isotope records, particularly C14, which Clette follows much more closely. Clette and S&S agree exceedingly well from 1749 on. Before that the uncertainty is very great. as the data is VERY sparse, e.g. in 1738 there were observations on only a single day. The group number for that year has an uncertainly of plus/minus 20%, thus a span of 40%. Any difference or discrepancy would be in the noise. Also see how much it deviates from the official sunspot number. As Muscheler said: “the sunspot and radionuclide records agree well. Especially the 14C-based record agrees very well with the revised sunspot data, lending STRONG support to these revisions. BTW, the 10Be record is not so good [contaminated by climate]. [Reply] “Clette and S&S agree exceedingly well from 1749 on” Not according to the black and blue curves on fig’s 10 and 11. “Before that the uncertainty is very great.” Maybe that’s why Usoskin’s series starts in 1749. “And Usoskin’s new GSN is precisely the one that I show is wrong:” As I already told you, they are preparing an addendum, and you should respond to it in the literature, because I won’t give you a platform to attack them here. “BTW, the 10Be record is not so good” The Antarctic 10Be appears to closely match Clette’s reconstruction (especially where your GSN goes way over the top in the 1700s). 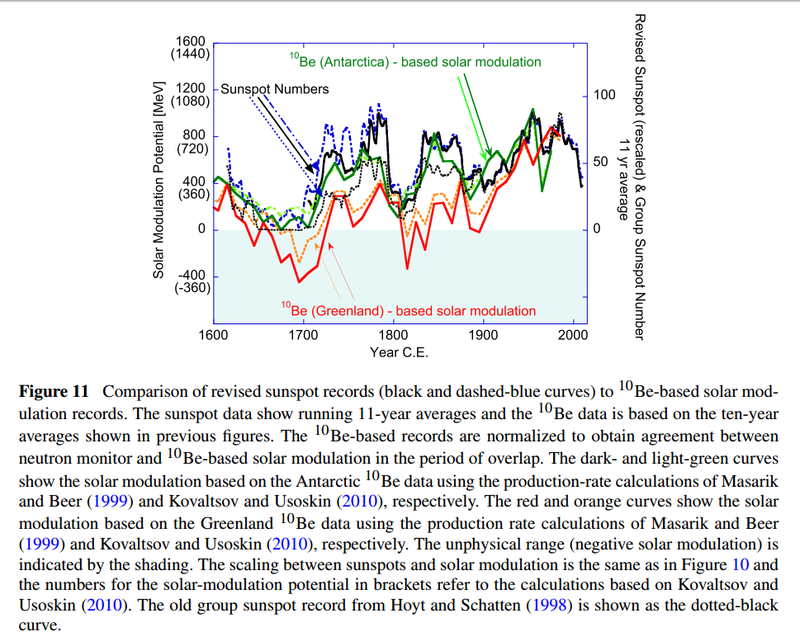 Pretty tragic watching Svalgaard trot out the same old tired graphs for at least a decade..he definitely the outlier with his sunspot re creation. The solar experts not liking his “backbone” method. No grand minima across the Holocene occurring in the first column. The first column is the period when Neptune and Uranus are opposed. If the data cannot be falsified it is clear there is a planetary influence on on solar grand minima. The black and blue curves agree exceedingly well after 1749. The pink curve is Clette, the blue S&S. Show the graph here if you have any integrity left. It is amazing that you could deny this. On Usoskin: my papers are all submitted to journals for peer review and will probably be published after the usual delay of about a year. And I don’t need your platform for showing that Usoskin et al. are wrong. Even the sunspot number [Clette] and the solar modulation [Muscheler] show that already. My emphasis is to find out WHY they are wrong, not IF, as that is by now ell-established. But, don’t despair: with your curve fitting I’m sure you can fit our new series just as well as with the old, perhaps, you need yet another cycle or two, e.g. the 1000-yr cycle some people are peddling. Steinhilber’s 10Be was mostly based on Greenland. Before 1749 the data are to poor to even discuss discrepancies, except, of course, if they fit one’s bias. 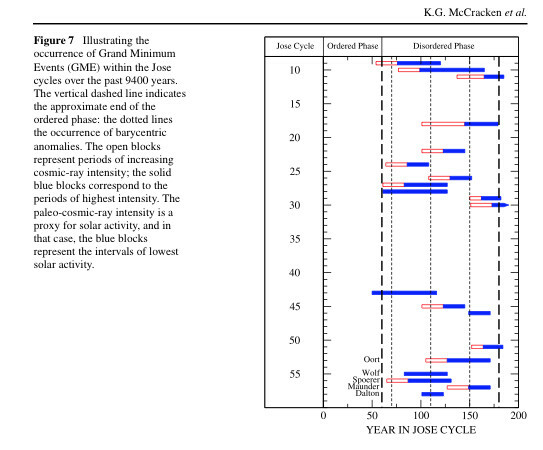 [Reply] So far as I can tell from the text, the black curve on figs 10 and 11 is Clette’s SSN reconstruction not GSN. See comment at 7:05 AM above. 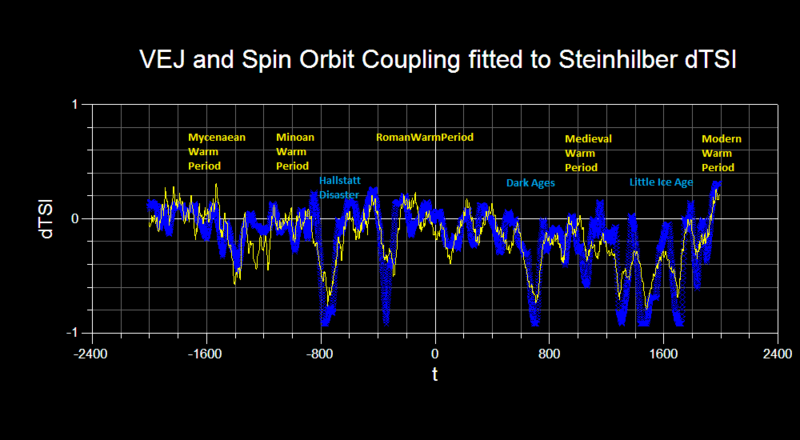 Temperature is driven a combination of the various orbital cycles and the cycles in solar activity with the millennial cycle being the most significant. Bottom line: Clette and I agree completely after 1749 and the differences before that is entirely in the noise. Not mine, but Norman’s where he claims a 1000-yr cycle. You may need that cycle too for your curve fitting. I note that you are afraid of taking my comments out of moderation.